I suppose what first amazes is the sheer variety of music here. Despite my pics in this review, Manchester North Of England: A Story Of Independent Music Greater Manchester 1977-1993, out tomorrow on Cherry Red Records, is not a box-set of just the usual suspects in the story of the city's musical past. This is not just 7 (!) CDs' worth of The Fall, The Stone Roses, New Order, and so on. What it is is perhaps the most comprehensive look yet at this town's rich legacy, a legacy that continues to this day, of course. Now, despite the nearly 10 hours of music here, and despite the generous 7 discs, and the enormous booklet and lengthy essays, someone's gonna complain about the omission of The Smiths. And while that band's music is not here for what are presumably rights issues, Morrissey is here along with every other Manc act you could possibly think of. The set is, to put it simply, an amazing thing for anyone who's been a fan of punk, post-punk, New Wave, baggy, acid house, or Britpop in the 16 years covered here. It's time to dive in so let's look at each disc a bit as I attempt to control my raving about this collection. Disc 1 of Manchester North Of England: A Story Of Independent Music Greater Manchester 1977-1993 wisely starts a bit earlier than Joy Division (pictured above). What's here to kick things off is "Breakdown (demo)" by The Buzzcocks, DeVoto-fronted and perfect in its economic attack. Setting a pattern that will spread over 7 discs, the set uses a big name to start off each disc to kind of give you what you expect before showering you with some obscure riches. Highlights here next to Joy Division and Magazine cuts, are the essential "Cranked Up Really High" by Slaughter and the Dogs and the near-pub rock of The Distractions whose "Maybe It's Love" sounds like a real classic. Elsewhere, a rarity from Jilted John livens things up before stunners from The Nosebleeds and The Smirks burn up the speakers. A final revelation on this one is "The Kill" by Spherical Objects, all Joy Division-y angst mixed with a Magazine-style sense of paranoia. "Rowche Rumble" rudely kicks off Disc 2 and it's further proof of the unique and enduring charms of The Fall (pictured below). Also here are fine tracks from The Chameleons ("In Shreds"), The Blue Orchids ("The Flood"), The Durutti Column ("Lips That Would Kiss"), and A Certain Ratio (the bouncy-and-bright "The Fox"). Also here are more obscure numbers like the sleek New Wave of "My Cherry Is Sherry" by Ludus, the clattering raga-rock of "Does It Matter Irene" by Mothmen, and the absolutely wonderful "Yesterday's Love" from Any Trouble, Clive Gregson's band that ended up signed to Stiff Records. Disc 3 sees an awareness of Manchester's importance seep through the material from Graham Fellows' "Love at the Hacienda" to disc-opener and dancefloor-filler "Temptation" from New Order. It is here that one can hear the impact of Factory Records and the beginnings of what we can see now was the Manchester sound coming into its own. So much of Disc 3 is significant, from the shiny electro-pop of "Looking From a Hilltop" from Section 25, to "All At Once" by Stockholm Monsters, all early New Order rhythms dressed up as a happy pop tune. Elsewhere, there's the lo-fi ramblings of "Working And Shopping" by Tools You Can Trust and the noisy and direct "Kitchen Sink Drama" by the criminally underrated A Witness. Since so much of what's on Disc 3 is important (and enjoyable), it seems fair to say that this disc stands as one of the most solid parts of Manchester North Of England: A Story Of Independent Music Greater Manchester 1977-1993. The first pleasant surprise on Disc 4 is the appearance of rare, early James track "Chain Mail", a number that reminds a listener to include this lot in with the list of the big names in Manchester rock. A very early Inspiral Caprets track ("Garage Full of Flowers") foreshadows the Manchester wave that would sweep UK indie in the early Nineties even if this cut is more Nuggets-era noodling than anything else, while "Whistling In The Dark" recalls the band, Easterhouse, that I think some people -- me, at least -- once called the Commie U2, big hooks and big ideas still bristling with life 3 decades or so later. Also anchoring Disc 4 and providing a sense of time and place are a few numbers from C86-mainstays Big Flame and The Bodines, reminders of the pure joys of following Manchester indie in the tail-end of the years dominated by The Smiths. 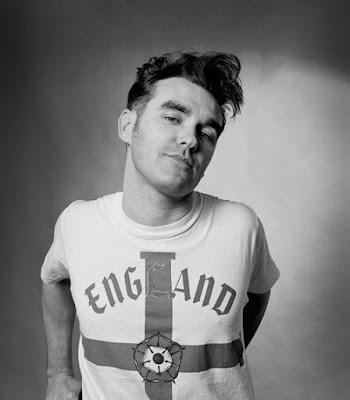 If The Smiths are not here at least Morrissey, pictured above, is. His "The Last Of The Famous International Playboys" anchors Disc 5 of Manchester North Of England: A Story Of Independent Music Greater Manchester 1977-1993. Similarly Bradford's fey "Skin Storm" reminds one of what Morrissey's stamp of approval could do back then for a new band. Elsewhere, Chameleons spin-off The Sun and The Moon deliver "C'est La Vie", a slice of superb alt-rock that is, like the band's one album, smart and complex music that deserves a retrospective all its own, while "Voodoo Ray" by A Guy Called Gerald had to be here, all odd beats and warped rhythms offering up one of the seminal numbers of the acid house era. 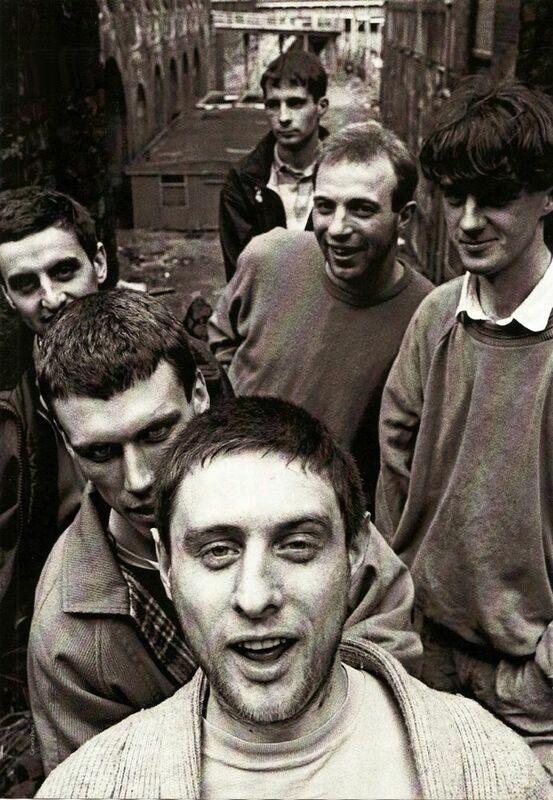 "24 Hour Party People" by Happy Mondays (pictured below) takes its place here as a sort of new standard of the age. 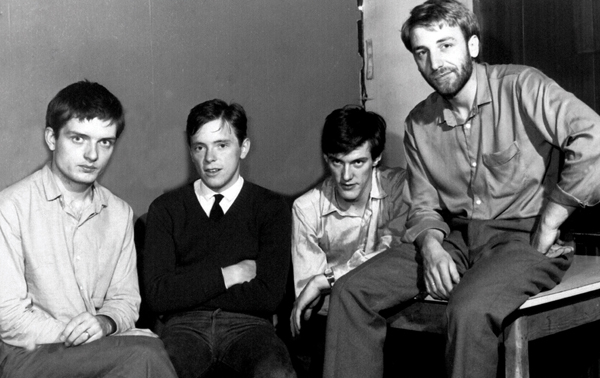 The band was, like a few in this era and in this city, attempting to invent a new music, one that would be perched between indie rock and dance music. 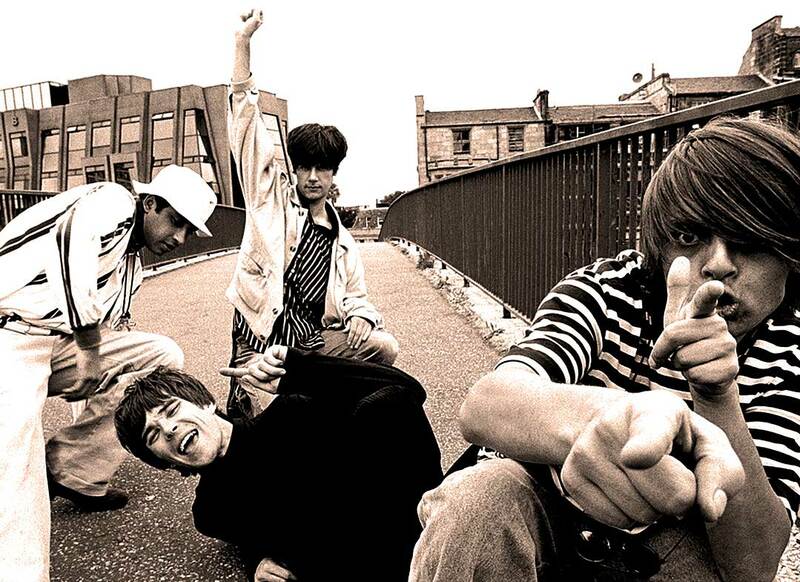 Disc 6 wisely uses a flip-side from The Stone Roses (pictured up top) to make a case for the band's greatness and importance to the city's legacy, the shuffling, lopsided rhythm of the tune prefiguring so very much of what was to come out of this town in the early Nineties. Similarly, a few numbers from that era ("Box Set Go" by The High, "Big (edit)" by New Fast Automatic Daffodils) sound remarkably good still, while a few, namely "Shall We Take a Trip" by Northside, sound hopeless prisoners of the past. Still, that aside, lots of Disc 6 is fantastic, from New Order spin-offs (Revenge, whose demo of "7 Reasons" juts up nicely against early Electronic single "Getting Away With It"), to surprisingly strong guitar-based indie numbers from The Train Set ("Hold On"), The Mock Turtles ("And Then She Smiles"), and The Cygnet Ring (the excellent "18 Daze"). 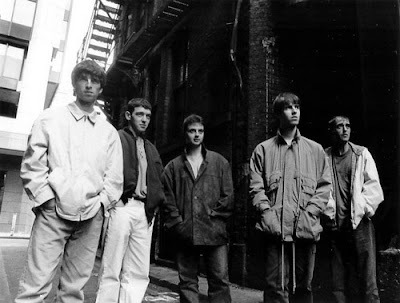 The final disc of Manchester North Of England: A Story Of Independent Music Greater Manchester 1977-1993 necessarily includes Oasis (pictured above) whose career changed the course of British pop and inspired a whole new generation of bands from the city. Naturally, the set ends with them, the demo of "Columbia" from 1993 signaling a sea-change in popular music in Manchester and England, while other numbers from Sub Sub (the pre-Doves lot's trippy "Space Face") and 808 State (the essential "Cubik") simultaneously indicate a temporary lull in guitar-rock as dance-y stuff was taking over, at least for a few years before the Gallaghers would hit it big. Admirably, this collection finds room for the non-rock numbers from the era, with fine tracks from Intastella, Lionrock, The Chemical Brothers, and Hypnotone indicating another legacy of Manchester. 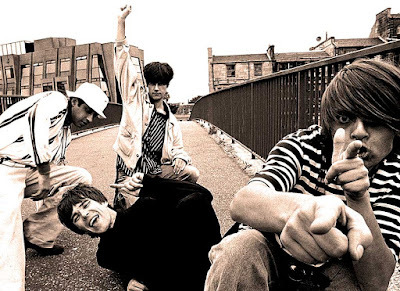 Still, it's the numbers here that blend the dance elements with the rock ones that succeed the most ("Sproston Green" by The Charlatans, the heavy-beating "Sons Of The Stage" by World Of Twist). Shockingly comprehensive, Manchester North Of England: A Story Of Independent Music Greater Manchester 1977-1993 is an amazing piece of work. These 7 discs give a crash course into why "They're from Manchester" was a phrase that one could use for decades to convince someone to listen to a new band, or an obscure track. That notification that a group was from this city was usually enough to get one's attention, and here are dozens and dozens of reasons why. The folks at Cherry Red Records have performed a Herculean task here but they've somehow provided just enough music from Manchester's history, post-the first wave of punk and pre-Britpop, to offer up a near-encyclopedic musical portrait of the city, its people, styles, fads, and trends. 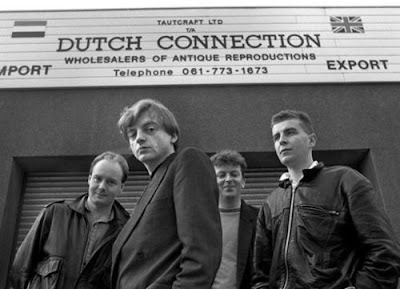 Genre-hopping and somehow entirely cohesive, Manchester North Of England: A Story Of Independent Music Greater Manchester 1977-1993 presents a musical compilation that flows effortlessly, never once sounding forced in its leaps across styles. The peaks, valleys, and odd detours in that the path from early Buzzcocks to early Oasis is a fascinating journey and any listener with even a marginal interest in any of the bands here, or the city itself, would be wise to get this as soon as possible. 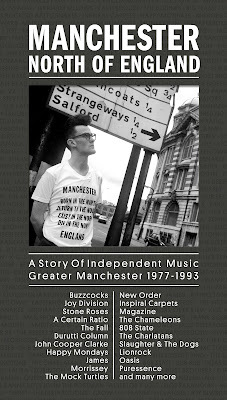 Manchester North Of England: A Story Of Independent Music Greater Manchester 1977-1993 is out tomorrow via Cherry Red Records.